Angkor was the capital of the Khmer Empire that evolved from the 9th century north of the lake Tonle Sap. The Empire encompassed much of south-east Asia, and it has had a lot of political and cultural influence on the whole region until its downfall in the 14th century. 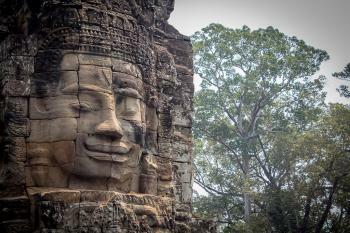 Because of this influence of the Khmer Empire and because a number of artistic masterpieces are still left, the site was placed on the World Heritage List. The first Khmer capital erected here was Roluos. Over the next centuries, the various Khmer rulers built other capital cities for themselves in this area. It was Suryavarman II who built Angkor Wat in the early 12th century, the greatest of all Khmer monuments. Jayavarman VII was responsible for building Angkor Thom, including the Bayon (dedicated to Buddha). Angkor possibly is one of the WHS that attracts the most visitors. The nearby town of Siem Reap is packed with hotels and other amenities for every budget. And still it's not enough, cause a lot of construction is going on to create even more of this. I stayed there for 5 days, and made 4 separate visits to Angkor. I had bought a 3 day pass (for 40 US dollar), but I easily could have stayed longer cause there's so much to see. In all I took over 300 pictures, a personal record of one site. The good thing about Angkor is that it's very diverse. So the 7th temple still is interesting. My first round I did on a bicycle. I followed what is called the Mini Tour (or Small Circuit). This mainly focusses on Angkor Wat and Angkor Thom, the two sites closest to Siem Reap and possibly the most impressive. Angkor Wat is the famous building that's on Cambodia's national flag. One of the temples in Angkor Thom is the Bayon, the one with the large smiling Bodhissatva faces. The next day I went to Banteay Srei, one of the more remote temples. It stands out because red sandstone was used and the carvings here are very delicate. It's a smaller temple than most, but extremely pretty and in very good condition. On the 3rd day, I decided to check out the famous sunrise at Angkor Wat. So I jumped on the backseat of a motorbike at the center of Siem Reap at 5.30 in the morning, and off we went. The now familiar road to Angkor was buzzing with all kinds of transport, hundreds of people on their way to see the sunrise. The spectacle itself I found a bit disappointing, but it's great to be out there among the monuments so early in the morning. In the afternoon I did my final round, the Grand Circuit. This takes you along some smaller temples. One of these is Neak Pean, a circular temple in an artificial lake. What makes a truly great site? To me a truly great site is one where you could remove the best parts of the site and still have a great site. E.g. Rome is great even if you were to ignore the Colosseum and the Pantheon. You still have the Forum Romanum, the Roman Walls, the Circus Maximus, ... The same applies to Angkor. 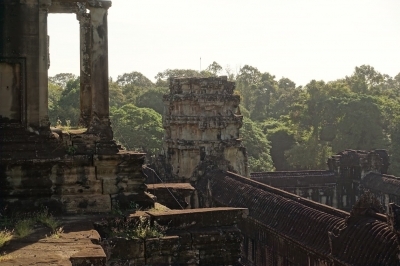 Angkor is not just about Angkor Wat or Bayon. Its a huge area with a host of great temples, some smaller, some bigger, but all unique and incredible. 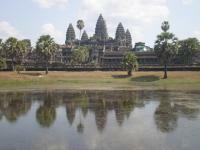 In total I spend 3 nights in Siem Reap and two days visiting the sites of nearby Angkor. I did not have the time to venture further outside to Banteay Srei as recommended by others. My personal highlights were Angkor Wat, South Gate of Angkor Thom plus bridge, Bayon (amazing stonework), Preah Khan and Ta Prohm (the Tomb Raider temple). Most scenic is Neak Pean, tugged away on a small island in a huge artificial lake. Admittedly, I got into a bit of fatigue each day. Literally, as the temperature and humidity in combination made visiting Angkor quite tiring. And more generally as there is just so much to take in. Personally, I would recommend having a few days and starting with the lesser sites first before making your way to the big ones. The lesser sites also tend to be less frequented by tour busses and less crowded as a consequence. Siem Reap has a small international airport. If you are arriving in Phnom Penh you can take a bus or minibus to Siem Reap. The minibus option comes recommended. To get from Siem Reap to Angkor you can hire a driver. Most hotels will offer to arrange this at a minor surcharge. I think I paid around 15-20 USD for my Tuk Tuk each day. You can also go by car (more expensive), but I love riding in Tuk Tuks, so this was not an option. The first stop you will make is at the huge ticket facility. They now have multiple queues for the different types of passes you want to buy: 1 day (37 USD), 3 day (62 USD) and week (72 USD). Prices went up significantly in 2017 and I feel fairly confident that this will continue. At least, you can nowadays pay with credit card. And the ticket is a nice souvenir as it comes with your own picture. Mainly, though, this is intended to prevent sharing/reselling of tickets. Inner Circle (the highlights): Angkor Wat, Angkor Thom, Thommanon, ... and ending at Ta Prohm. I think you could do this in a very long day if you wanted to. I preferred sticking to half day trips. In general I would have enjoyed just hiking around Angkor for a day. But again thanks to heat and humidity, this was not an option. I would recommend visiting both Preah Vihear and Sambor Prei Kuk. Both can be done as day trips from Siem Reap. There are also three tentative sites nearby. Siem Reap itself is very touristy with ever more hotels being added. The city itself offers plenty of amusement options (Pub Street), but very little to actually go and see. The ruins of Angkor are included in the Angkor Archaeological Park, which extends for about 400 km square kilometres (although the urban area of Angkor might have been over 1000 square kilometres), and it’s one of the most important archaeological sites in South-East Asia. The ruins include over a thousand temples, among which the most important are the incredible Angkor Wat, the Ta Prohm, the ancient city of Angkor Thom and its centrepiece, the Bayon, the less popular but still breathtaking Banteay Srei, Preah Khan, Prasat Bakong and a multitude of smaller temples of which many are now just a pile of bricks. The best way to visit Angkor is by staying in Siem Reap and arrange transportation to the Archaeological Park from the city. Considering that over two million people visit the place annually, it’s definitely not a problem to find the type of organized or individual tour that meets anyone expectations. I visited Angkor back in 2011 with four friends. We hired a local guide, who helped us to visit the most interesting sections of this huge complex, and we hire a tuk-tuk driver that took us around the site for the entire time we were there. The first suggestion the guide gave us was to keep the Angkor Wat for the end of the tour to avoid spoiling all the rest. That was indeed a great tip! There are several other ways to visit the site: organised tours, bicycles, buses, elephants (Please don’t!) etc.. The tuk-tuk gave us the freedom to move at our own pace and the independence that we wanted, and at the same time it made the exploration enjoyable. In my opinion, another good option could be to explore the site by bicycle, but it is really too big if short on time and Cambodia is very hot all year round. I’m not going to describe all the temples that we saw, they were too many, but the experience was unforgettable. I usually tend to avoid going back to a place I had already been. Not with Angkor. Angkor is one of the few places where I would like to go again. I feel there’s so much more to explore than what I know about it. Coming from Siem Reap in the south, the first temple on the road is the Angkor Wat that, as I said earlier, we left for last. 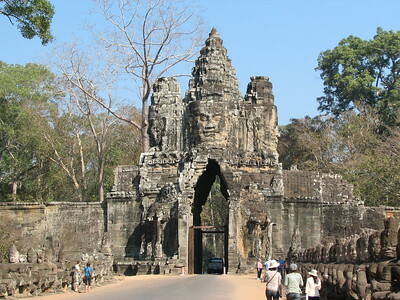 We headed for the huge walled city of Angkor Thom and entered it from the South Gate. Angkor Thom, as all the main temples in Angkor, was a walled city with a square shape, whose sides are perfectly oriented north-south and east-west, surrounded by a moat. Another feature of Angkor was in fact its incredible waterworks. Angkor Thom is by far the largest walled city. Its sides are over 3.5 km long and it encompasses countless ruins. The most popular among all the temples within Angkor Thom is the Bayon. 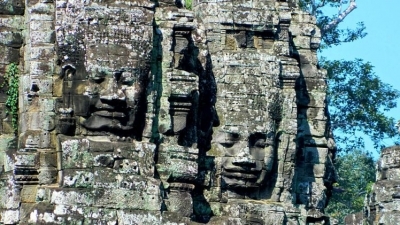 The Bayon is known for the hundreds of gigantic stone smiling faces and its sets of bas-reliefs. Another temple inside Angkor Thom that I really enjoyed is the Baphuon, located just north of the Bayon. What I liked about this temple is that is was converted from a Hindu temple to a Buddhist temple and they used the construction materials of the tower (typical in hindu temples) to start building a reclining Buddha that was never completed. After going around Angkor Thom, with hundreds of ruins surrounding us, we decided to leave the walled city and headed east for another important temple, made famous by the movie Tomb Raider that was filmed there: the Ta Prohm. I have no words to describe this temple. It felt like being in an Indiana Jones (or Tomb Raider) movie. The main feature of Ta Prohm is the gigantic trees that started to grow on the walls of the temple since it was abandoned in the 15th century, following the fall of the Khmer Empire. It’s simply breathtaking. A few kilometers away from the main Angkor area is another temple that is included in the UNESCO World Heritage List: Banteay Srei. The peculiarity of Banteay Srei is the fact that it’s built of red sandstone, so finely carved that the decorations are still incredibly beautiful today, and its buildings are a scaled miniature version of the usual structures of Khmer temples. No visit of the Archaeological Park should end without going to the masterpiece: the majestic Angkor Wat. Angkor Wat is the largest religious monument in the world, built at the end of the 12th century, it’s now the symbol of Cambodia. Like the other main temples in the area, it is surrounded by a square moat and a wall but it’s the only one facing west instead of east. Angkor Wat is an outstanding example of Khmer architecture, the so-called Angkor Wat style, for obvious reasons. It was originally built as an Hindu temple to be later slowly converted into a Buddhist temple. It is simply breathtaking, one of the most impressive monuments I’ve ever seen. That is why it is better to visit it at the end of the tour, its majesty shadows everything else. An incredible site - one of the best in the world. To really appreciate it, you need several days. If you go flat out for one day then you'll be able to see all the 'highlights' but they're generally quite crowded. It's only by day two or day three that you start to see some of the more special ones and start to notice the details in them. It's not just about the huge buildings - as impressive as they are. It's also about the carvings and the way things have been designed for very specific purposes. I was lucky to travel through all Cambodia in February 2007. I spent 2 weeks there, crossing all the country from North to South. This country has left a deep trace in my heart and I dream about another two weeks there! My trip to Siem Reap from Aranyaprathet , a white old taxi in clouds of red dust, my fears about what was waiting for me in Siem Reap… I will never forget this! I visited almost all the temples of Angkor Archeological park. Everything there was special!!! I am Russian, so khmer culture was something absolutely miraculous for me! Mostly I liked Angkor Thom with plenty of apsaras. Each of them had an enigma oh her face. Bayon is spectacular! You feel yourself there in another dimension, absolutely out of time! Temples and Trees of Ta Phrom will impress ANY person! And, unbelievable, proud Angkor Wat – is something so breath-taking, that does not have analogues in all the world! I will always keep Cambodia in my heart as a large flower of never-dying lotus with all legends and dreams of the gorgeous khmer civilization. For some reasons, I appreciated Angkor Wat better in the afternoon - at sunset - than during the popular and obligatory sunrise visit where all tourists to Angkor are expected start their journeys with. In either case, it was such a delight to see that Angkor still receives a lot of visitors even during off peak seasons! Of all the many temples and ensembles I have seen, I really cherished my experience at Bayon, the 'almost secret' ground alleys of the Terrace of the Leper King, and Prasat Kravan - the last two only receiving a handful of tourists. Prasat Kravan (which has a twin temple as well in Takeo province - the Prasat Neang Khmau) is probably one of the under-appreciated temples in Angkor, but I personally think that it is one of the most unique - the murals of the central tower was indeed a find, and it has a history much older than most. Unfortunately, I never got to feel the amazement that people usually claim to have experienced at Sras Srang (the royal bath) as it was under renovation when I last visited. Aside from the enigmatic temples in the area, I find the water system - barays and the canals - to be just as interesting and intriguing. I could only agree that Angkor is indeed one of the best cultural wonders (if not the best) and an incredible engineering feat the world has to offer. It's definitely a topnotcher. TIP 1: I always find that watching a performance of the Royal Cambodian Ballet (Apsara Dance and Cultural Shows) complements well one's visit to Angkor. TIP 2: If I were to recommend, be sure to see and at least spend some time exploring Bayon, the terraces, Ta Prohm, Pre Rup, Banteay Srei, Sras Srang (after the repairs! 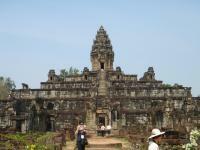 ), Prasat Kravan, Neak Pean, and Angkor Wat. I visited this amazing WHS in February 2011. Angkor Wat is actually a temple complex of around 400km2 (bigger than my home country). There are outstanding sunrise and sunset moments to enjoy and it is very easy to get "templed out" after 2-3 days of intense exploration through jungle temples, major temples, minor temples, etc. The relationship between nature and the temple of Ta Phrom can be clearly seen as you try to understand whether the jungle trees or the temples came first. Some trees can still be seen growing on the temples or indeed through the temples with roots coming out of everywhere. 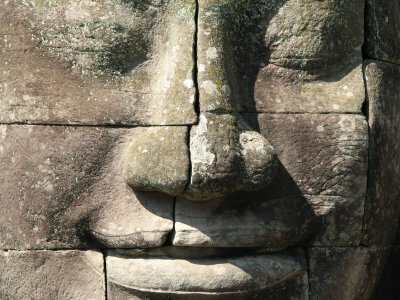 You will surely feel observed while walking through the Bayon Temple, with the hundreds of sculpted faces smiling at you. Another one of my favourite WHS, no doubt about that. I can imagine a few sites being the equal of Angkor, but surely there is nothing that can better it. The sheer amount of temples would be impressive, but each one seems to be some form of new masterpiece. I spent 3 days travelling around the temples and didn’t get bored; each new one was a delight. My personal favourites were the Bayon, Preah Khan and Pre Rup (all on the Grand Circuit). I almost missed my highlight, which was an early morning where I had Bantaey Srei all to myself. The temple was magnificent, and displayed a different batch of imagery to that which is frequently used in the central Angkorian complexes. I almost didn’t make the trip out there and it was only because I decided to go to Kbal Spean and had to be back for an early afternoon bus that I was there by myself. However it was certainly worth the trip. I can’t really add anything more to what people have already stated here. It is well worth as much time as you can spend on it. I would recommend travelling around the sites by TukTuk as it is very affordable and gives you a better view of the sites and environment. Outstanding, the best World Heritage Site I have visited. (April 2010). I visited Angkor in November 2009, and am still amazed by what I saw. The remains are beautiful and inspiring. The sheer size is mind-boggling. I took two days to tour Angkor Wat and Angkor Thom, Elephant Platform and surrounding temples..and did not even scratch the surface. The details on the reliefs draw you close to admire their craftsmanship. The emmense size of the walled cities are breath-taking. Enjoy these treasures while they last. The city of Siem Reap is a typical third world tourist city, but offers some incredible dining and shopping opportunities. I'd suggest renting a bicycle as well as riding an elephant while in Angkor. Suppose one day you woke up from a dream of wanting to visit one of the most magnificent temples in the world. The Angkor Wat temple in Cambodia would come close to satisfying that dream. There are few places anywhere on earth to match the splendour of Angkor Wat. The temple is one of the largest monuments to religion ever built and is truly one the wonders of the world. I've been there 2 times already. But I always wish to go there (Angkor Wat) again. Because at there (Cambodia) have a lot of ruins to see. I luv Angkor. When I see Angkor Wat, one word came into my mind “Angkor Sans Encore”; there is no need to repeat any word of Angkor’s beauty, grand and the overwhelm feeling that happen to almost everyone who see it for the first time as you can read from other posters. Two years ago I joined the trip to Southern Laos and Northeastern Thailand with an excursion to Preah Vihear of Cambodia to see many amazing ancient Khmer temples in that region. I was really impressed with their beauty and hoped one day I will have a chance to see Khmer cultural apex at Angkor, and finally on March 2009, I had opportunity to go to Cambodia and my first priority was seeing Angkor. 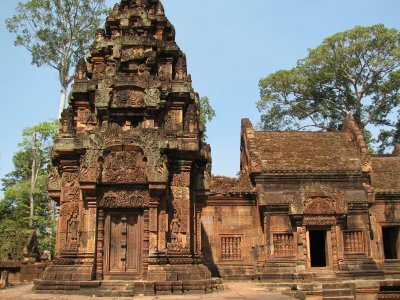 To be honest, all Khmer temples I saw in 2007 can not be compared with the ruins of Angkor as the art of Angkor is much more superior and offer more styles with many unique structures. Angkor does not mean only Angkor Wat, but including many ruins in the vicinity areas such as Bayon, Ta Prohm, Preah Khan, Pre Rup, and with specific mention in the UNESCO document, Banteay Srei and Rolous complex. 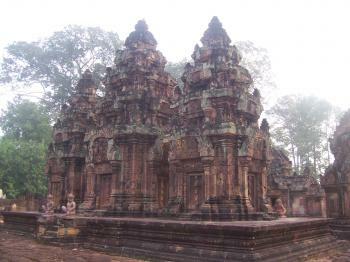 My review will focus on Banteay Srei and Bakong, the main temple of Rolous complex. Both temples were constructed before Angkor Wat, but their beauty of both places, in my opinion, maybe far better. Banteay Srei, the beautiful small pink sandstone temple, is unbelievable for its high quality of rock carving, so delicate and unique with shining pink and red. This temple is also the only temple that could be considered as completed as other temples even Angkor Wat had been left unfinished, small but truly a top sight for my trip. Bakong, a pyramid shape temple, has unique look and many similarities with Balinese temple style and is considered to be the first masterpiece on this area that believed to be the capital city of ancient Khmer Empire prior to Angkor. Visit Bakong is not easy as it is quite far from Angkor complex and not included in the typical tourist routes. This temple is not fascinating liked Angkor or Banteay Srei, but for art development, Bakong is the place where you can see the transformation of brick temple to stone temple, so I highly recommended visiting this place. In my opinion, Khmer art is developed almost in the same style with minor change of decoration, the only thing that change is the size of temple. From small Vat Phou, Bakong, Pre Rup and Banteay Srei, Khmer expanded their temple bigger and bigger until it reach zenith of scale at Angkor Wat follow by little bit smaller but unique Bayon. As I mentioned other Khmer temples in the World heritage list, Vat Phou and Preah Vihear or even Phanomroong in the tentative list of Thailand are very inferior when compared with Angkor, if you see Angkor before you may have negative view on those sites, as I had one with Vat Phou after I saw Preah Vihear, so to avoid the problem and be more appreciated in Khmer art development, try to keep Angkor at the end of your trip, a highly recommendation. As Khmer civilization is currently underrepresented in world heritage list, Cambodia and its neighbor country, Thailand is starting to propose more sites, and most of their proposal is pre-Angkor temple complexes. So maybe we are going to see many forgotten Khmer ruins be put into the list in the nearby future. A good way to protect their heritage or this is just another way to increase tourists in the lesser known attractions areas by using UNESCO label? anyway I always wanted to visit angkor event though I am 40s' old I never had seen angkor only heard and read about it, But never be at the place. I have to admit that this is one of the greatest world heritage sites! The area spanding of hundreds of kilometres square, and could only be embraced by having an at least 3 days tour. It is recommended to go during the dry season, although it will be dusty. But it means you could enjoy your tour without having to stop just because of the rain. I was there for the first time in late 1960s as a child. I never forget the feeling when I was inside Angkor Wat. I felt like I was stepping back in time. It was so surreal, and of course there were a lot more statues in there back then. We reached Phnom Kulen in the late evening. After we ate my father stepped away a little bit from us. The next thing we saw was he was running toward us saying that he can hear the tiger near by. Needless to say, we all got inside the car and left. Angkor Wat - The Ancient Architectural & Historical Wonder in the World & UNESCO World Heritage Site. When I stepped into the Angkor Complex on my 1st day of visit, I was truly stunned and amazed. My wish has come true ! all are truly magnificent sites! Not only is angkor breathtaking, but stand at a spot of your choosing, and imagine yourself surrounded by the times before its ruins. Monks walking by, soldiers guarding the royal walkways, boats and canoes align along the waterfronts. Lovers enjoying picking, champa flowers (lilies), and people of all sorts walk the busy street of this once powerful city. It has been three times now that I have visited the great temple of Cambodia. It's amazing everytime I looked at all those stone carvings on the stone wall, they looked so real. The Apsaras smile is fantastic, it looks so real. Ta Prom where you can pound your chest and you can hear your chest sounds like a thunder, it's fantastic! There are so many Apsaras statues needed to be renovated, also there are so many stones that have fallen on the ground and almost disappeared into the ground. 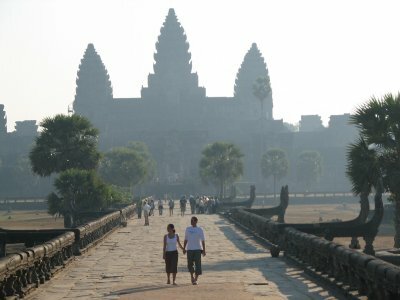 I'll be the guide to my Canadian and German friends who will visiting Cambodian temples in November this year 2005. I hope to see other temples renovated by the time we visit. I would say that Angkor is the single most enthralling historical site I have ever seen. The range of levels of preservation is unique among such culturally important "must see" temples. You can not only see some temples in relatively very good repair, but you can also see temples that have been intentionally left as is. You get a chance to discover these temples as they were when they were first "re-discovered" nearly 150 years ago. I have wanted to see Angkor since a friend visited in 2001 and brought back tales of a country finding a new sense of its self and its history. Despite having traveled nearly half of the world previously, I have to say I was a little nervous venturing into Cambodia. These fears turned out to be completely baseless. The Khmers are among the most friendly and genuinely nice people I have come across. When visiting many of the other must see historical sights around the world, I have been poisoned, extorted, and generally treated like the locals would rather just take my money and be done with me. This was not the feeling I got while in Cambodia. Angkor has not yet reached the tourism levels of the Great Pyramids or the Taj Mahal and therefore still allows you the chance to occasionally have a moment alone with your awe. I went to Cambodia with the expectation of seeing Angkor Wat temple and nothing else. I was blown away by the vast amount of other temples in the Angkor complex. If you decide to make the trip, you should definitely set aside a minimum of 4-5 days to see the entire complex. Travel into the nearby countryside and check out the Tonle Sap. Angkor, it's breathe taking monument's and carving is a must see.. i love and enjoyed every moment of my time at Angkor. Welcome to Cambodia! 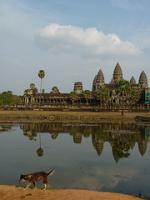 And discover the splendor of History, Nature, Culture and Heritage of Cambodia. Cambodia has about everything for everyone. Apart from beautiful heritage places, smiling faces and graces that speak of genuine warmth and charming hospitality, it is rich with distinctive customs and traditions, which are visible in various aspects of architecture, art and craft. The country presents a fascinating history, diverse geography, and rich cultural heritage. Bordered by Thailand in the west, Laos in the north, and Vietnam in the east. Its intriguing architectural and historical Wonder Angkor Wat, Tha Propham, Bayaon and many others ... Mesmerizing remnants of the past will spellbound you with endless wonders and fascination. The ancient temple Angkor Wat is one of the greatest wonders of the oriental world. Masterpieces of decorative details as well as of architectural style, its awe-inspiring ruins survive as testament to the spectacular achievements of Southeast Asias greatest civilization. Today, Angkor is attracting world attention as a priceless heritage site and at the same time, Angkor remains an enduring monument to the people of Cambodia, their past glories, their hopes and aspirations. Angkor is a symbol of power, of greatness, of immortality. Angkor Wat and the other stone temples of the ancient capital of the Khmer were built by god-kings to link the human and the divine in life. Angkor Thom, built in the late 11th century, covers almost four square miles and is enclosed by a 26 foot high wall. The moat surrounding it was once stocked with crocodiles. Its five monumental gates, each more more than 65 feet high, are dominated by four carved faces of the Buddhist Bodhisattva Avalokitesvara, facing north, south, east and west. In front of each gate are giant statues of 54 gods on the left, 54 demons on the right. The Bayon rests in the center of Angkor Thom. It is a massive cluster of towers carved with 172 faces of the Bodhisattva. Its interior walls are covered with bas-reliefs, ceremonial pageants or the everyday life of 12th century Angkor. We hope that you will take a passage through Angkor, appreciating it in its entirety, not as the scattered remains of the past but as a vital design in the cultural fabric of the Khmer world. Come and Explore Cambodia.. The Angkor experience! Just got back from an asian vacation that included Angkor. I have always wanted to see it, and it was spectacular! It was so huge, and the temples so numerous and massive. The impact of the Khmer Rouge was very apparent; the heads of many statues had been chopped off to be sold on the black market by soldiers, the condition of the ruins in general is perilous. The guides let people touch, walk, and climb all over the temples and its grounds which has also contributed to its condition. It is truly a remarkable sight, and anyone interested in ancient culture and heritage should not miss this. The town of Siem Reap was small, nice and safe. People were kind and friendly, and hotels were decent. The best time of day to see the temples is at dawn or dusk. Make sure you get up early and stay till dusk. The sunrises and sunsets are spectacular. Breath-taking. Unbelievable carvings and buildings and many areas are under reconstruction. There are so many sites, it will take several days to see the major sites. Superior food and accomodations in the area. The landmine museum, a small, local place just outside of town was also interesting. Brick architecture: Angkor's Pre Rup and Roluos complex are brick buildings. Hospitals: "The Chapel of the Hospital" - The chapel is all that remains of a hospital built during the reign of King Jayavarman VII (1125-1218 r from c1181) He is credited with constructing 102 hospitals within Cambodia, inspired by his Mahayana Buddhist beliefs. In modern times he has become "a kind of paradigmatic national hero, who was credited not only with establishing the full greatness of the Cambodian nation but also with bringing into being a welfare state that was motivated by Buddhism and dedicated to serving both the spiritual and the physical needs of the Cambodian people" (Brtiannica). Recorded cultural discoveries: Henry Mouhot (French) is credited with 'discovering' it in 1860 although many other Westerners had visited the site before him. He certainly popularised it in the West. Hindu Sites in non Hindu countries: Construction commencend in the first half of the 12th century as a Hindu temple dedicated to Vishnu. It was converted to a buddhist temple in the late 13th century when King Jayavarman VIII, who was Hindu, was deposed by his son in law,Srindravarman. Srindravarman had spent the previous 10 years in Sri Lanka becoming ordained as a Buddhist monk. Built in the 9th century: First capital from 802, earliest remaining temples date from ca. 880. Lots of later additions though, Angkor Wat for example dates from the 12th century. 383 Community Members have visited.